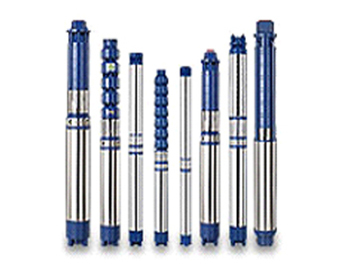 "PEW" submersible pumps are vertical, multi stage, centrifugal pumps with motor at the bottom & pump at the top. The water enters at the bottom of the pump and flows upwards through many stages. The stainless steel/bronze impellers rotate inside the diffusers with inherent guide vanes. The diffusers direct water leaving each impeller towards the suction opening of the next impeller. Such a flow through each stage of impeller and diffuser combination adds pressure at each stage and finally water under high pressure is discharged through outlet at the top. Upper Housing, Lower Housing, Adaptor, Motor Base, suction and NRV are made of C.I. FG-220 Grade. 100% pure EC Grade copper used for winding wire which is dual coated with insulation Class B. High thickness LTB-4 Bushes and Extremely hardwearing Water lubricated thrust carbon bearing with heavy Tilting Pad of Stainless Steel AISI-420 S.S. grade ensures zero working maintenance. 'SAND PROOF' design of mechanical seal rings and Sand Guard protection. FG 250 Grade Investment casting non-magnetic pump bowls. AISI 410 S.S. Grade pump impellers are a standard feature for all mixed flow and radial flowpumpsets. AISI 410 S.S. Sleeves are reinforced with chromium for proven wear resistant performance. Pure AISI 410 S.S Grade Pump Shaft. Max. permissible sand in water: 50 g/m³. Silver brazed rotor in all varieties.